Does Chocolate actually cause acne? Now here I begin, I am in LOVE with chocolate. Chocolate bars, chocolate pudding, chocolate milk and chocolate ice cream. Throughout the years, my family teased me stating that if I continued to consume that amount of chocolate, I will get pimples and break out. Unfortunately, that was not the first time I heard that statement. Therefore, I wondered if they were just trying to trick me and save their money or if they were actually right. I do not have major acne, however sometimes I do have miniature break outs and I wonder what factors cause that. Is it the chocolate causing this? We begin with the hypothesis, either the consumption of chocolate will or will not cause acne. I will use the hypothesis, The consumption of chocolate will NOT just cause acne because if you really think about it, numerous third variables are involved like genetics, sleep patterns, other foods, sweat, medications and stress. I read a journal article online from the Journal of the American Academy of Dermatology and a single blind experiment was conducted including 54 college students. Within the two groups, one group consumed a 1.55 oz milk chocolate bar each and the other consumed 15 jelly beans each. The experiment displayed that within 48 hours, the more chocolate consumed the more acne occurrences there were. They claimed that, “the chocolate consumption caused more inflammation.” This one study however does not prove that chocolate causes acne since an experiment with a larger group would be more reliable. Another journal article online from The National Center for Biotechnology Information stated how they experimented on 14 men between the ages of 18 and 35 who do get acne and instead of eating a chocolate bar or candy, the men had to take capsules that contained “unsweetened 100-percent cocoa, hydrolyzed gelatin powder, or both.” At the end of the experiment, with the men who had a history of acne, it increased due to consumption of chocolate. However, at the end of the article it stated how there was no actual evidence that this proves chocolate affects the skin or not. People claimed that forms of chocolate caused acne since the 1930’s. However, CVS pharmacy online stated that people who are more prone to acne would “probably” get breakouts from certain diets than others. Yes, a certain diet can affect ones skin however there are ways to balance chocolate into a diet without getting acne (most dairy products are known for causing acne rather than chocolate). It really depends on the third variables involved that I stated in the beginning! The correlation relating to acne and pimples is that one will most likely receive acne from chocolate consumption if he or she is prone to getting acne rather than a person who has more clear skin! After reading the articles, it can be a positive or negative correlation it just depends on the person consuming the chocolate! Therefore, my beginning hypothesis, “The consumption of chocolate will NOT just cause acne,” was proven to be true. Delost, Gregory R., Maria E. Delost, and Jennifer Lloyd. “The Impact of Chocolate Consumption on Acne Vulgaris in College Students: A Randomized Crossover Study.” 75.1 (2016): 220-22. Http://www.jaad.org. JAAD. Web. 11 Oct. 2016. <http://www.jaad.org/article/S0190-9622(16)01395-5/pdf>. Caperton, Caroline, Samantha Block, Martha Viera, Jonette Keri, and Brian Berman. “Double-blind, Placebo-controlled Study Assessing the Effect of Chocolate Consumption in Subjects with a History of Acne Vulgaris.” The Journal of Clinical and Aesthetic Dermatology. Matrix Medical Communications, May 2014. Web. 12 Oct. 2016. <https://www.ncbi.nlm.nih.gov/pmc/articles/PMC4025515/>. Type, By Course or. “FAQ Categories.” I Suffer from Acne, Is There Anything I Can Eat to Help Reduce It? N.p., n.d. Web. 17 Oct. 2016. <http://www.nestle-family.com/nutrition-health/faq/english/i-suffer-from-acne-is-there-anything-i-can-eat-to-help-reduce-it_197617.aspx>. “True or False: Eating Chocolate (or Other Fatty Foods) Causes Acne.” Symptoms Wellness 156967. N.p., n.d. Web. 17 Oct. 2016. <http://health.cvs.com/GetContent.aspx?token=f75979d3-9c7c-4b16-af56-3e122a3f19e3Z&chunkiid=156967>. REKHA, By. “Printer Friendly Version.” Printer Friendly Version. N.p., n.d. Web. 17 Oct. 2016. <http://www.koko.gov.my/lkm/ploader.cfm?page=industry%2FArticleOC.cfm>. This entry was posted in Uncategorized on October 17, 2016 by Taylor Rodrigues. I am also an avid chocolate eater. The creamery chocolate milk is addictive. I have not noticed any difference in my personal acne and the excessive amount of chocolate milk I drink. I think there is definitely a third variable that determines it. For example, the processed sugars found in some candy bars, or even the other ingredients in candy bars such as caramel. I am also a chocolate lover so I have often wondering whether my chocolate addiction would increase breakouts (so far I haven’t noticed any differences). I think that you explained the two studies really well and it makes sense that it depends on the person that is eating the chocolate because everyone’s skin reacts in different ways. While reading through your blog I started to wonder whether the type of chocolate might have any effect. Therefore I found this article which discusses the effects of white, milk, and dark chocolate on people’s skin. It’s true that in these studies you also have to take into account the confounding variables. Also the article mentions that the topic is still being researched and that in order to see more conclusive effects the participants would have to be studied for a longer period of time. While reading this article I began to wonder, do different types of chocolate have different effects on those who are prone to acne? For example, it is widely known that dark chocolate is better for you than milk or white chocolate, so does that also stand true for your skin? Dark chocolate has less dairy, sugar, and additives than milk and white chocolate, so one may think that it won’t have as big as an effect on a person who is prone to breakouts. While there isn’t to much research on this question, this article http://www.huffingtonpost.com/2012/06/05/does-chocolate-cause-acne_n_1566076.html goes into more detail. So if one wants to be on the safe side when it comes to eating chocolate, it may be better to eat dark chocolate than milk or white chocolate. Hello Taylor. Great article. 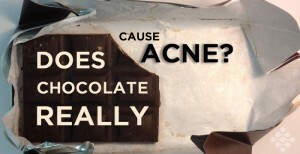 I agree with you that it is not only chocolate caused the acne. Because most of kids got acne on their face when they are 12-22 years old. So according to research, kids in this age are in the sate of puberty. So their body start to produce hormones. And during this time, kids also being their middle or high school works, so they have a lot of pressure from their school. And this can cause the acne on their face. Also, the teenagers tend to sleep less because they like to watch movie or playing games on their tablet or on their phone. Because human’s body did not get enough sleep, so the organ in their body start to feel tired also, and will not work properly. So this also going to cause the acne. But lots of kid start to pop or squeeze the acne. But this might cause a more serious problem, and left a scar on the face . Here is a website explain why we should not squeeze the acne. When initially reading this post, I thought the whole time that acne definitely is something related back to your genetics, rather than just chocolate. Chocolate can be a correlation, but not necessarily the causation. This is a study that you will definitely see all different results for different people due to many third variables to take into consideration. Because this topic interested me, I looked further into it and found a study that sided with my belief that the more prone you are to acne (due to genetics), the more acne will appear when high acne risk products are consumed in great quantities. Here: https://www.ncbi.nlm.nih.gov/pmc/articles/PMC4025515/ is a link to a double blind placebo controlled trial between chocolate consumption and acne prone male subjects. The results show a low and medium strength p value that chocolate increased acne for acne prone males, suggesting that there is something going on between the two variables. Ah yes, chocolate. I too am a very big fan of this sugary, rich treat, and sometimes, I cannot resist it. I too questioned chocolate’s effect on acne. Now that you answered the question of acne, I began to think what are the other possible cons to chocolate? According to Dr. Sarah Brewer, she provides a list of pros, and cons to chocolate. Although none of these effects are proven through an actual study/trial, it’s a good article to consider if you were to research other effects further. Some interesting pros include the fact that chocolate can be a mood-lifter, and that it also contains small amounts of caffeine in it. Other cons listed are the risk of tooth decay, and in-contrast to it being mood lifting, it may make endorphins (which cause good moods) to increase too much creating mood-swings. These are some of the confounding variables that you didn’t further research, and there are many more. Overall though, I found your blog stimulating and very easy to follow. My one piece of advice would be to maybe find one more study to include to support your conclusion since your blog isn’t that long and has room for more.